What: The event will feature full blown dirt late models as well as dirt modifieds. The dirt cars will circle a tiny 1/4 mile speedway inside The Dome in St. Louis. All the ingredients for a fantastic week of dirt track racing in Saint Louis. When: The dirt track racing begins on Thursday December 15th. Thursday, Friday and of course Saturday will have a feature race. So, any night is a good night to head to the Dome. However, the main event will take place on Saturday December 17th. View the full racing order line-up schedule below. Track prep has been underway all week and it’s being completed by local guys who know what they’re doing. I think it’s a great idea. The dirt comes from a nearby area. Nobody knows St. Louis area dirt better than those who work on it on a weekly basis. The Gateway Dirt Nationals staff have pegged the staff of Tri-City Speedway to prep their Dome race track. Tri-City Speedway is a dirt track located in nearby Pontoon Beach, IL. 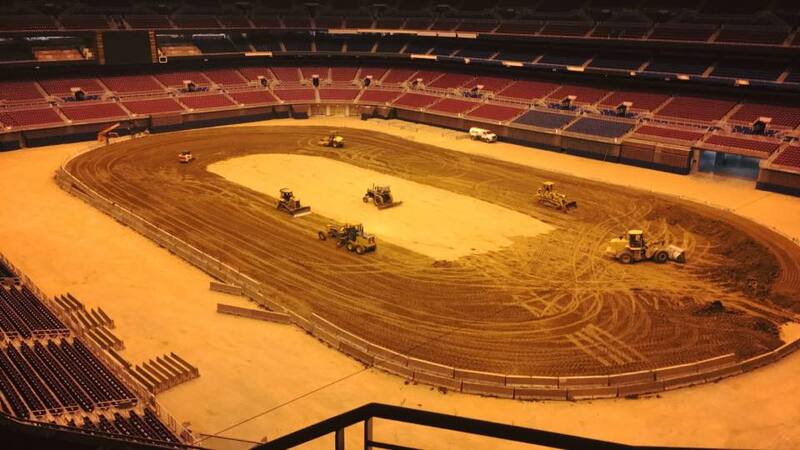 Where: The Gateway Dirt racing show will take place at the Edward Jones Dome located in Downtown St. Louis Missouri. The stadium address is 901 N Broadway, St. Louis, MO 63101. Gateway Dirt Tickets: If you aren’t yet planning to head to the Gateway Dirt Nationals you can purchase Gateway Dirt tickets here. Thursday and Friday tickets are at a cost of $25. The main event, scheduled for Saturday can be seen in person for just $35. Though you can save $5 by buying Friday and Saturday tickets together. View the full weekend schedule for the Gateway Dirt Nationals below. PARKING PROCEEDS UNTIL 12a.m Midnight. 6:30A.M.- 9:30A.M. – “LATE ARRIVAL” COMPETITOR PARKING – Failure to be parked on time will result in not being able to compete in the event. *THE TOP 2 FINISHERS IN EACH NON QUALIFIER RACE WILL HAVE THE OPTION TO TAKE RACE WINNINGS OR TRANSFER TO FRIDAY AND SATURDAY RACING ACTIVITIES. OPEN WHEEL MODIFIED HEATS CONCLUDE THURSDAYS PROGRAM. THIS INCLUDES ALL OF THE TOP 100 QUALIFYING OPEN WHEEL MODIFIED TEAMS AS WELL AS ANY TEAM FINISHING IN THE TOP 2 THAT ELECTED TO SURRENDER NON-QUALIFIER WINNINGS. 12:30p.m. – VENDORS EARLY ACCESS ONLY. TOP 6 finishers in each main event will be locked into the main event Saturday. These 6 Open wheel modified drivers and 6 Super Late Model drivers will redraw for their starting position at the “Friday Night Draw” After party. Location TBD – “Friday Night Draw” The official after party of the VP Racing Fuels Gateway Dirt Nationals. Top 6 Modified and Top 6 Super Late Model drivers required to attend for redraw. 9P.M. – MODIFIED TEAMS FAILING TO QUALIFY IN THE TOP 140 AND SUPER LATE MODEL TEAMS FAILING TO QUALIFY IN THE TOP 120 WILL BE REQUIRED TO START REMOVING EQUIPMENT AND EXITING THE AMERICA’S CENTER COMPLEX. THIS MUST BE COMPLETED BEFORE THE RACING EVENTS CONCLUDE THURSDAY NIGHT AND THE PIT AREA CLOSES. TEAMS ON STACKER ROW WILL REMAIN IN THEIR CURRENT PARKING SPOT FOR THE ENTIRE EVENT UNLESS SPECIFICALLY NOTIFIED. THE PIT AREA AND ANY ACCESS IS CLOSED EXACTLY 1 HOUR AFTER THE LAST CHECKERED FLAG DROPS EACH DAY. ALL TEAMS AND PIT PASS HOLDERS WILL BE REQUIRED TO EXIT THE BUILDING AT THAT TIME. 12:30A.M. – 2A.M. – TRAILER PARKING FOR TOP 100 OPEN WHEEL MODIFIED TEAMS AND TOP 100 SUPER LATE MODEL TEAMS (DOES NOT APPLY TO RESERVED, STACKER STALL TEAMS) THESE PARKING SPOTS WILL BE ASSIGNED AT THE DISCRETION OF EVENT MANAGEMENT. TEAMS WILL NEED TO BE PREPARED TO PARK UNTIL THE 2A.M. DEADLINE. ANY REMAINING TEAMS WILL COMPLETE PARKING THE FOLLOWING MORNING. TEAMS WILL BE REQUIRED LOAD EQUIPMENT AND HAVE THEIR TRAILERS PREPARED TO BE HOOKED UP AND EXIT THE BUILDING. TEAMS TRUCKS, TRANSPORTERS, TOTERS ETC WILL NEED TO GET IN LINE AND ENTER THE BUILDING AS DIRECTED BY EVENT MANAGEMENT. UPON DIRECTION FROM EVENT MANAGEMENT, COMPETITORS WILL BE ABLE TO HOOK UP THEIR TRAILERS AND EXIT THE BUILDING. THIS PROCESS WILL PROCEED UNTIL ALL COMPETITORS HAVE EXITED THE BUILDING. TRAILERS ARE NOT ALLOWED TO STAY IN THE BUILDING OVERNIGHT. *COMPETITORS BEST TIME FROM 2 ROUNDS OF QUALIFYING WILL BE TAKEN. THE TOP 100 QUALIFIERS FROM EACH DIVISION WILL TRANSFER TO FRIDAY & SATURDAY RACING. ALL OPEN WHEEL MODIFIED QUALIFIERS FROM 101-140 WILL TRANSFER ON TO NON-QUALIFIER RACES WHICH WILL TAKE PLACE ON THURSDAY NIGHT. THERE ARE 2 OPEN WHEEL MODIFIED NON-QUALIFIER RACES WHICH ARE $750 TO WIN. ALL OPEN WHEEL MODIFIED QUALIFIERS THAT QUALIFY OUTSIDE THE TOP 140 FAIL TO QUALIFY FOR A NON-QUALIFIER RACE, NOR FRIDAY OR SATURDAY RACING. THESE COMPETITORS NEED TO PACK UP EQUIPMENT AND PREPARE TO EXIT THE BUILDING. (TEAMS IN STACKER ROW CANNOT MOVE TRAILER). *ALL SUPER LATE MODEL QUALIFIERS FROM 101-120 TRANSFER ON TO A NON-QUALIFIER RACE $1,000 TO WIN THURSDAY NIGHT. ALL SUPER LATE MODEL QUALIFIERS FAILING TO QUALIFY IN THE TOP 120, FAIL TO QUALIFY FOR THE REMAINING WEEKEND EVENTS AND NEED TO PREPARE TO EXIT THE BUILDING (TEAMS IN STACKER ROW CANNOT MOVE TRAILER).